I’ve got sympathy for casual buyers/renters blundering into the path of Warner’s new Karloff and Lugosi DVD set. The box says they’re Horror Classics, though closer examination puts the lie to that. Between forums and disc reviews, these four titles have been parsed into molecules and fan conclusions are pretty near the same. I’m like others for wanting everything K and L did at Warners/RKO/Allied Artists (those catalogues owned by WB). Having descended to Zombies On Broadway and You’ll Find Out, it looks as though victory is ours. Best of this pack The Walking Dead plays Judas Goat in leading collector sheep to the slaughter of Frankenstein – 1970 and aforementioned two. I won’t try reader patience dismembering these when for surprising fact there’s much to like about You’ll Find Out and points of interest in all four. Kay Kyser has always interested me for being a North Carolina native and having returned here after making a clean break from show biz in 1950. The story was that Kyser declared he’d drop out upon realizing a first million from performing. Apparently, that’s just what he did. Unlike bandleaders lured back to spotlights from retirement, Kyser put paid to all aspects of music-making life and had zero desire to revisit his past. Major names having done that number in a handful. I’ve not forgotten one of Richard Lamparski’s books wherein Kay was tracked down to Chapel Hill by NC collector Milo Holt and subjected to an afternoon of old Kyser musicals unspooled in the family’s living room. The former headliner’s daughters had no interest in seeing them and … it seemed Kay and Georgia (his wife Georgia Carroll) watched only out of politeness. That was 1973. Kay Kyser died in 1985. His daughter has subsequently taken up a documentary project with aid from the North Carolina Museum Of Art. I’ll want to see that when it’s done. 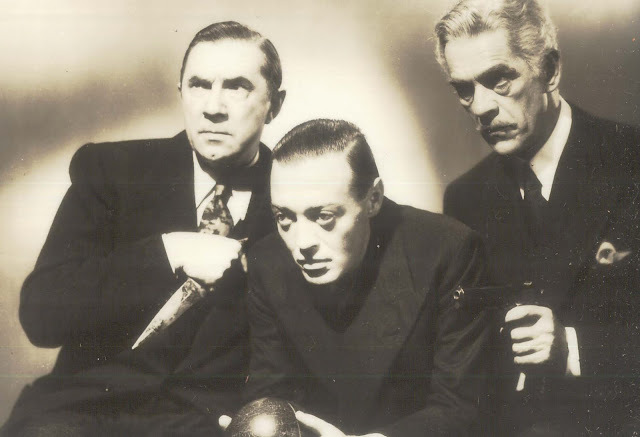 The Bad Humor Men that livened up You’ll Find Out in 1940 were Boris Karloff, Peter Lorre, and Bela Lugosi. Their billing played musical chairs according to which credits or poster you consulted. Wide audiences preferred the three laughing at themselves. These were days when Mom, Dad, and kids attended movies together and nothing split tickets like a show too scary for fragile patronage. The Frankensteins and Draculas weren’t worth a risk of sleepless nights for little ones. 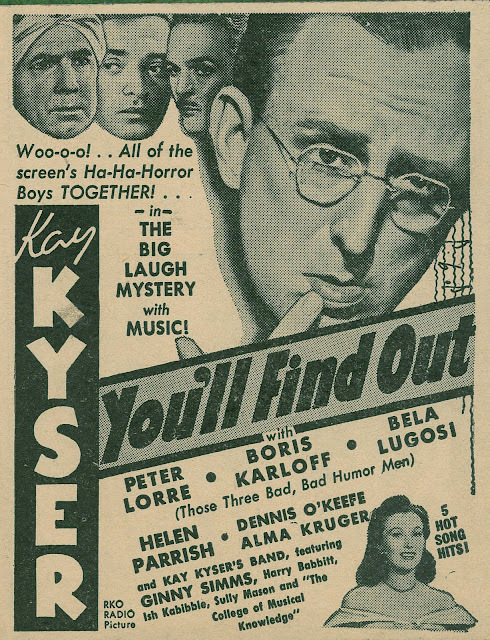 Horror films served best in isolation and done on small budgets, for they’d never broaden out to audiences so big as those listening weekly to Kay Kyser’s radio program. 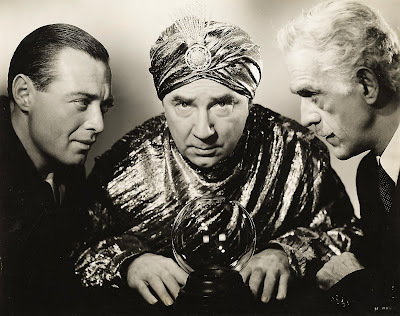 You’ll Find Out was the richest stage Karloff and Lugosi ever worked on together. Thousands would have been seeing them here for the first time. 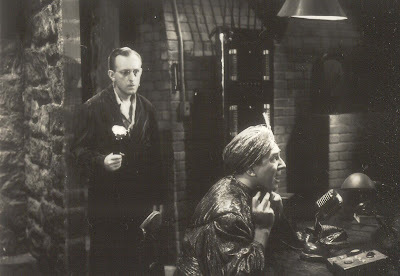 The likes of You’ll Find Out made K and L safer commodities, paving a way for spook spoofing to come and Karloff’s triumph of self-parody, Arsenic and Old Lace. I’m happy to see the pair amidst luxurious trappings wherein careful photography and elegant costuming display both at peaks of effectiveness (we fans are very protective of K and L’s status and dignity). It may be all in fun, but Lugosi here conducts a whale of a séance that I found creepier than many such episodes played straight amidst cheaper environs. Yes, you could say they’re "wasted," but there’s generally at least one of the three menacing Kyser and band throughout You’ll Find Out’s 97 minutes, so I was not restless. There’s a big dose of silly with every Kyser serving. Comedy became as much his shtick as music, and jesting band members were favorites with or minus instruments. Smoother than fire engine Spike Jones, the Kyser sound bounced from squirrelly to mellow depending on a given moment’s demand. Kay was immensely likeable and pretty good with dialogue (his a lilting drawl, just like mine). 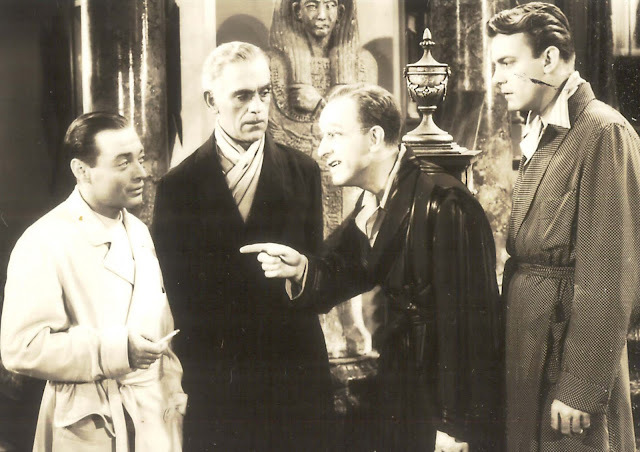 He didn't seem intimidated by powerhouse talent sharing sets and stages (a later co-star would be John Barrymore). You’ll Find Out opens with the band’s radio show in progress, and it’s here we glimpse how well Kyser worked his audience. 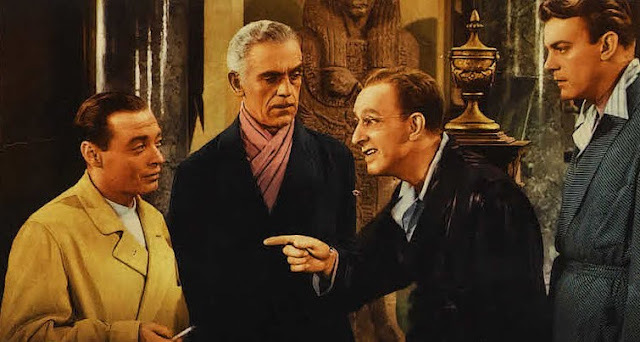 The act plays at a disadvantage later as YFT repairs to its haunted house, a setting more congenial to triple threat of Karloff, Lugosi, and Lorre. What’s left essentially replays Cat and Canary nonsense with extended slippage through hidden panels and concealed rooms. Nowaday fans have loosed microscopes upon scenes where Kyser comes across King Kong’s spider and dinosaur models inexplicably strewn about cupboards, these being a handy short-cut for RKO set decorators who’d kept the things in storage since 1933. With help of freeze frames, the 2009 Kong brain trust has identified each and all of these miniatures. Working my own pause button was a singular highlight of You’ll Find Out, but the thing I want to know is, what happened to those wonderful artifacts? How long did they survive? It seems someone told me of a Desilu sales reel wherein Desi Arnaz strode amongst props at the RKO lot he and Lucy bought in the fifties, and there were Kong models still in evidence. That would be some fifteen years after You’ll Find Out. Were all these little monsters eventually thrown away, or did little monster offspring of lot personnel wind up taking them home for play toys? Jon Provost wrote in his book, TIMMY'S IN THE WELL, that during his LASSIE breaks, he often sneaked into a storage building on the DESILU (RKO) lot and played with a MIGHTY JOE YOUNG model. As anyone who visits my horror-comedy blog (http://scaredsillybypaulcastiglia.blogspot.com) that previews the book I'm writing, I am partial to films like "Zombies on Broadway" and "You'll Find Out." I actually am in the camp that "Zombies" is pretty noteworthy both for being an unofficial sequel to "I Walked with a Zombie" (with borrowed cast members/characters and locations) but also for the genuine menace that predated Abbott & Costello meeting REAL monsters in 1948's all-time monster-comedy mash. I've yet to see "You'll Find Out" or its seeming cousin, "The Boogie Man Will Get You" but am anxious to see both and will be covering them for my project. I love the trailer and the scenes I've seen so far for "You'll Find Out" and my initial impression is that it was probably the perfect popcorn entertainment for its time, with the band boys in there pitching hard and the monsters enjoying menacing with tongues firmly in cheek. Most of the Marcel Delgado Kong animation models (or what's left of them) have been accounted for in various collections. The late Forry Ackerman owned the lion's share. Nowadays, many of the animals are making the long migration to New Zealand and a new home in director Peter Jackson's collection. Missing, however, is the Holy Grail of the Kong Beasts: the Tyrannosaur. Either it was dismantled for parts or has been well-hidden since the 1940's. I'll have to check out You'll Find Out; it sounds like a hoot. 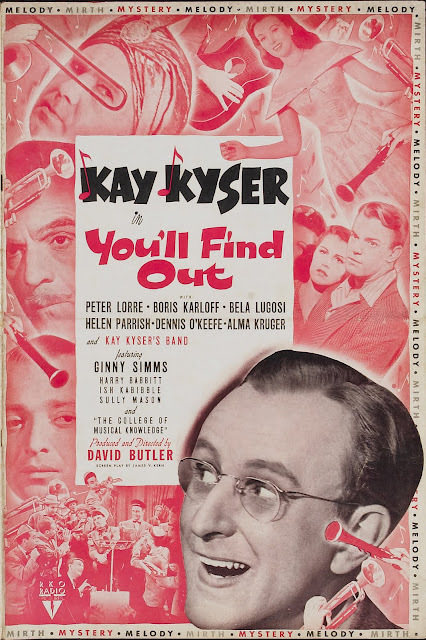 And you're right, Kay Kyser seems to have been the Greta Garbo of big band leaders -- when he quit, he quit, and that was it forever and amen. I remember in the 1960s when Capitol Records came out with an album, "Kay Kyser's Greatest Hits"; they assembled most of the band and all of the vocalists (Harry Babbitt, Ginny Simms, Ish Kabibble, Mike Douglas, etc.) to recreate the original arrangements. But Kyser refused to have anything to do with the project, which created a problem when it came to his trademark voice-overs introducing the singers. So Capitol brought in their house comedian, Stan Freberg, to impersonate Kay on the new recordings. When I interviewed Marcel Delgado in 1970, he told me that the models he built tended to deteriorate quickly, that the latex and adhesive he used started to oxidize as soon as they were exposed to the air. That was why he built two Kongs: one was always on the set while the other was in the shop being reconstructed. I'm surprised that any of the models survived for any length of time; it could be that the Holy Grail Tyrannosaur has long since been played with to death. Great info about the Kong and Mighty Joe models, and that's really interesting about the Kay Kyser reunion in the 60's, Jim. Thanks to you and Bolo for sending these facts along. A Kay Kyser documentary? That I'd actually pay to see. Also on the same DVD set, you will find the Maltese Falcon perched on a fireplace mantel, in a scene during Frankenstein 1970. Bob Burns spots and comments on it during the alternate commentary track. I'd read that Kay Kyser quit showbiz because entertaining post-World War II civilian audiences didn't give him the same charge as the troops. I tried watching The Walking Dead again the other night and, alas, it was kind of a snooze, some visual style as is typical of early Curtiz but it seemed to walk through the numbers of a Karloff misunderstood-scientist vehicle (in this case he's not the scientist, but same basic formula) in pretty routine fashion. To Paul Castiglia-- you should definitely see The Boogie Man Will Get You. 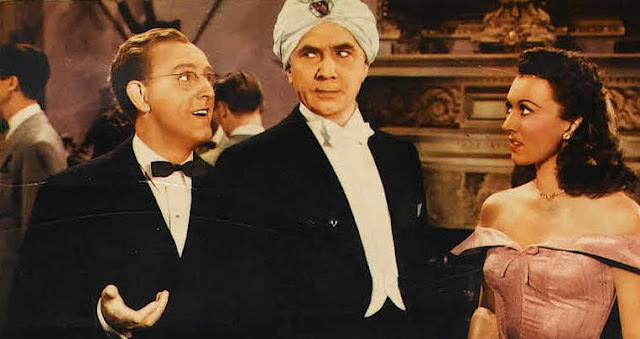 The script is kind of imitation Arsenic and Old Lace (it was made while Karloff was starring in that stage hit on Broadway), but it moves plenty fast and Lorre is really a hoot, anticipating his daffy-sinister turn in Beat the Devil. I expected little enough and was very pleasantly surprised. My father came away from the 1972 Diana Ross movie 'Lady Sings the Blues' thinking that perhaps Kay Kyser had turned Billie Holliday on to drugs.Why???? ?.Because, he said, the actor playing the band pianist who introduced Billie/Diana to heroin in the movie looked and spoke like Kyser(He thought).I argued strenuosly against this nonsense, and Dad said "Ok, you like Kay Kyser".It didn't seem to occur to my dad that:1:Things happen between the script's completion and the actual making of the film, such as the actor's interpretartion.2:'Lady Sings the Blues' was a work of fiction-more or less.3:Kyser became a Christian Scientist.Little did I know that Mr.Kyser was, at that very moment, working in Boston, where we were, at the Christian Science headquarters. About 8 years ago I contacted the North Carolina Museum of Art and asked about the Kyser documentary purported to be in progress by Kyser's daughter. They said the project was apparently no longer happening and they hadnt heard from Kyser's daughter in awhile (their words). Not surprising as she has dogged my tracks ever since I announced my KK documentary efforts in the mid 90s. Unfortunately, I had to abandon the plan after several years and no forthcoming investors. I did make a 13 minute condensed version for pitching purposes utilizing the video interviews I conducted with Kyser's widow, both daughters, Harry Babbitt (KK vocalist)and 3 other band members. I ended up cutting my financial losses and using much of the material for my book, KAY KYSER-THE OL' PROFESSOR OF SWING! AMERICA'S FORGOTTEN SUPERSTAR (available at www.kaykyserbook.com and Amazon). Even if I never get financing for my project, I do hope someday someone sees the light and gives Kyser the credit he deserves. So much is not known about him and his contributions,except to those of us who've done the digging.